Fishing With Flies :: Blog: Fishingwithflies.com is 10 years old (nearly) ! Fishingwithflies.com is 10 years old (nearly) ! 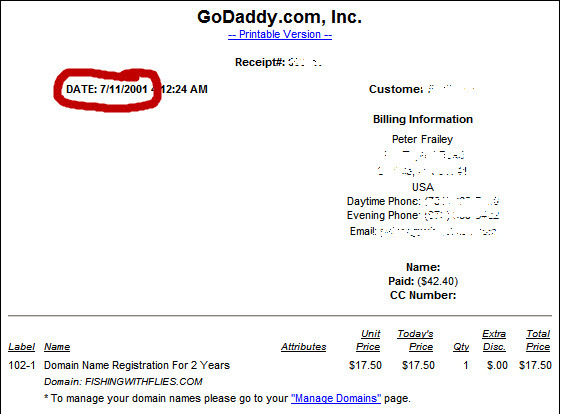 Last week my electronic scheduler signaled that it was time to log into my account at Godaddy (which has hosted fishingwithflies.com since the beginning) to renew my domain name. When I clicked on "my account" I saw that the domain was up for renewal in July. But I always like to renew a few months early...just in case. Incidentally, Website domain names aren't particularly expensive, at about $10-$15 per year. What surprised me, and I don't think I'd noticed this before, is that Godaddy maintains a complete record of all my transactions, in chronological order. I went right to the first page and found my very first Godaddy order. It was nearly 10 years ago, in July of 2001, that I registered my domain name. Times flies!! I recall being very pleased that it was available because I thought it was such a good name for the Web site that I was planning. I saw, too, that I had ordered Godaddy's inhouse Web site software, Website Complete, in 2001. It got things up and operating quickly, but they soon stopped supporting it and I found myself switching to Microsoft's Frontpage 2000 and then Frontpage 2003. Now, Frontpage is no longer supported by Microsoft, though I can still create Web pages and upload them to the servers at Godaddy. I dread the day that I might have to switch to something else. I also saw in my Godaddy account that I had signed up for "statistics" beginning in 2009 though I don't recall ever looking at the data. But I did today. 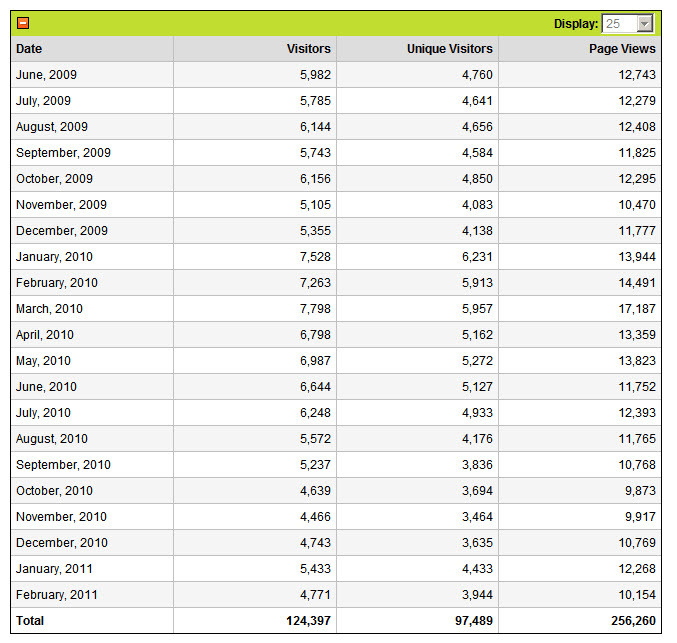 I was pleased to see that I am getting about 4,000 unique visitors per week. That's pretty cool. I should point out that you are reading this post on my blog, which is a google blog. This is located on google's servers and not on Godaddy. (You can learn more about blogs at http://www.blogger.com/.) My blog has it's own separate domain name, fishingwithfliesblog.com, but I have connected my two domains with links and made the green background color as identical as possible, so that it appears that I have just one Web site. Blogs have some advantages. They are very easy to update, from anywhere and from any computer, because you don't need any software. A disadvantage might be that they are not as customizable as having your own Web site software. Though there are many templates for blogs, and you can change colors and fonts, etc., they all have a basic and recognizable format.